Pipelines are a vital and often overlooked component of America’s infrastructure, and their safety record is largely excellent. See Interstate Natural Gas Association of America, “Pipeline Safety Facts.” However, recent, high-profile pipeline accidents in California, Michigan, Pennsylvania, and elsewhere have brought heightened congressional, regulatory, and public scrutiny to the safety of the 2.6 million miles of gas and hazardous liquids pipelines in the United States. This expanded scrutiny coincides with a dramatic increase in the production of domestic shale gas resources and a growing demand for pipeline infrastructure to move these resources to consumers. 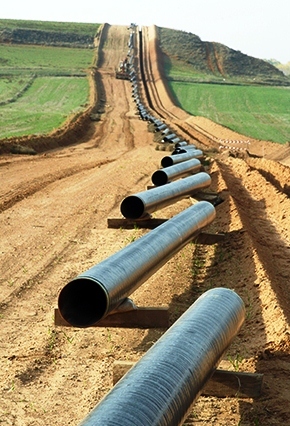 Gathering pipelines, the pipelines that transport gas from production facilities to transmission lines or mains (49 C.F.R. § 192.3), often by way of processing plants, make up a significant portion of the new pipelines being constructed to move domestic shale supplies. In January 2012, the president signed the Pipeline Safety, Regulatory Certainty, and Job Creation Act of 2011 (2011 Act), which amends the Federal Pipeline Safety Laws and addresses gas gathering pipelines. Pub. L. No. 112-90 (Jan. 3, 2012). The U.S. Department of Transportation’s Pipeline and Hazardous Materials Safety Administration (PHMSA) is charged with administering these laws, and even before the 2011 Act was passed, the agency had initiated a rulemaking proceeding that raised potential changes in gas gathering regulations. 76 Fed. Reg. 53,086 (Aug. 25, 2011). The 2011 Act and PHMSA’s rulemaking may alter the regulatory framework for gas gathering, which may affect the transportation of America’s shale natural gas resources. While the outcome of PHMSA’s efforts remains uncertain at this point, it bears watching how the agency will weigh the costs and benefits associated with any changes to the gathering pipeline regulations. The Pipeline Safety Laws provided the Department of Transportation with jurisdiction over the transportation of gas and hazardous liquids by pipeline in or affecting interstate commerce and the pipeline facilities that transport these materials. 49 U.S.C. § 60101 et seq. The department delegates this authority, in turn, to the administrator of PHMSA. 49 C.F.R. § 1.53. The transportation of gas includes transmission, distribution, gathering, and storage of gas. 49 U.S.C. § 60101(a)(21). While all gas transmission and distribution pipelines are subject to PHMSA regulations, gathering pipeline facilities are exempt from PHMSA regulations in rural areas. 49 C.F.R. §§ 192.3, 192.8. More specifically, PHMSA regulations do not apply to gathering pipelines in Class 1 areas, defined as areas that extend 220 yards on either side of any continuous 1-mile length of pipeline and contain ten or fewer buildings intended for human occupancy. 49 C.F.R. § 192.5. Many U.S. gathering lines are located in Class 1 areas. Rural gas gathering lines have historically been exempted from federal pipeline safety regulation because they are located away from population centers and present relatively low risk. In the Natural Gas Pipeline Safety Act of 1968, Congress explicitly prohibited the regulation of rural gathering pipelines. Pub. L. No. 90-481, § 2(a). Congress amended the law in 1992 to allow PHMSA to define the term “regulated gathering line” to include rural gathering lines, but only if they met certain operational and functional characteristics. 49 U.S.C. §§ 60101(a)(21), (b). By requiring PHMSA to consider the location, length from the well site, operating pressure, throughput, and the composition of transported gas, in rural gathering lines, Congress indicated that such lines were not to be regulated absent close scrutiny of the safety risks they posed. In a 2006 rulemaking to update its gas gathering pipeline rules, PHMSA reviewed the safety risks of gathering lines and determined that low risks posed by gas gathering lines in Class 1 locations did not warrant subjecting these facilities to its regulation. 71 Fed. Reg. 13,289, 13,291 (2006). Since 2006, the dramatic increase in shale gas development has necessitated a significant increase in construction of new rural gathering lines. Analysts predict that significant investments in midstream infrastructure, including gathering facilities, will continue to be necessary in the coming decades. A recent study by the Interstate Natural Gas Association of America Foundation found that 16,500 miles of new gathering pipelines will be needed each year at an annual cost of $1.7 billion, along with a $900 million annual investment in new gas processing plants. These gathering and processing facilities are the important link between shale gas production areas and transmission lines that carry the gas to markets. Congress and PHMSA have each reacted to the expansion of shale gas gathering infrastructure by undertaking evaluations of the sufficiency of the existing regulatory framework. PHMSA has responded by asserting that the diameters and operating pressures of these new lines exceed those of traditional gathering lines and suggesting that the presumption that these facilities are low risk may no longer be appropriate. 76 Fed. Reg. at 53,100–101. In August 2011, PHMSA issued a wide-ranging Advanced Notice of Proposed Rulemaking (Advanced Notice) suggesting numerous changes to its Part 192 gas regulations. Among the many issues discussed, PHMSA addressed the current gathering framework and posed numerous questions about whether it should be changed. Id. PHMSA indicated that of approximately 230,000 miles of gas gathering lines in the United States, the agency only regulates about 20,150 miles. Id. The agency solicited public comment on, among other issues, whether it should collect data from all gathering lines, including Class 1 lines, redefine the term “gathering line,” and establish new risk-based requirements for large-diameter, high-pressure rural gathering lines. Id. PHMSA received over 100 comments on its 2011 Advanced Notice from a wide array of stakeholders, including pipelines, contractors, trade associations, and the public. The comments expressed a range of views, including opposition to any change in the gathering framework, suggestions that any changes must be based on a careful collection and analysis of data, recommendations for a separate gathering rulemaking proceeding, and landowner concerns over the lack of regulation over rural gathering lines. PHMSA has not yet proposed any follow up action from its Advanced Notice. Congress also addressed gas gathering pipelines in the 2011 Act by requiring PHMSA to perform a review of the sufficiency of existing regulations over gas and hazardous liquid gathering lines and submit a report and recommendations to Congress on whether any regulatory exemptions should be modified or revoked. Pub. L. No. 112-90, § 21. In performing its review under the 2011Act, PHMSA must assess the sufficiency of existing state and federal gathering laws and regulations; weigh the economic impacts, technical practicability, and challenges associated with applying federal regulations to currently unregulated gathering lines; and compare them to the public safety benefits that would accrue, subject to a risk-based assessment. Id. It is reasonable to assume that PHMSA may integrate the gathering analysis it began under its 2011 Advanced Notice with the study mandated in the 2011 Act. The limiting factors that PHMSA must consider in the 2011 Act gathering study carry forward Congress’s historical caution regarding the expansion of gathering regulations. These factors suggest that additional regulation of gathering pipelines, if any, is warranted only where justified under the balancing of factors that go beyond a typical cost-benefit analysis. The 2011 Act study requirement also suggests that any substantive gathering rulemaking that PHMSA contemplates following the 2011 Advanced Notice should be informed by the results of the study. In addition to federal regulatory and congressional activity, recent incidents have resulted in increasing public interest in pipelines. Among the public comments to PHMSA’s 2011 Advanced Notice, several were from Pennsylvania landowners objecting to the rapid growth and lack of federal regulation over rural gas pipelines in the Marcellus shale region. These comments show a level of direct public involvement and sophistication that is uncommon in PHMSA rulemakings and suggest potential new obstacles to projects going forward. In addition to this greater public scrutiny, the Pennsylvania governor recently enacted legislation that gives the Pennsylvania Public Utilities Commission jurisdiction over the safety of non-rural gas gathering lines. PA Act 127 (Dec. 22, 2011). This new authority brings gathering lines into Pennsylvania’s existing intrastate pipeline safety program. Ohio, another state with significant shale gas resources, has also passed legislation that broadens its authority over gathering pipelines, including new Class 1 pipelines. Ohio S.B. 315. In a further example of increased public involvement, opposition coalesced around the construction of an interstate pipeline in New Jersey that likely would have been constructed with little fanfare just a few years ago. After much public controversy and protest, the Federal Energy Regulatory Commission recently approved construction of a 20-mile pipeline that will run beneath Bayonne and Jersey City, New Jersey, to connect New York City to pipelines serving the Marcellus shale and other production areas. The project’s opponents cited the possibility of pipeline explosions beneath nearby water bodies and densely populated areas, as well as the environmental implications of a new connection to shale production. This led the project’s developers to implement several design measures that exceed PHMSA’s standards, demonstrating the significant effects public opposition may have on controversial pipeline projects. With the 2011 Act, PHMSA’s rulemaking, and increased public involvement in pipeline safety, the scrutiny of gathering pipeline systems remains high. Even relatively small changes in the safety regulatory framework could have potentially significant effects on gathering pipelines and the economics of shale gas transportation. For example, Rural, Class 1 gathering lines have not previously been regulated for safety and could face substantial compliance costs associated with heightened inspection, operations, maintenance, and other requirements if they become subject to PHMSA requirements. For marginal gathering lines, this could result in the facilities becoming uneconomic to operate. While it is unclear whether and how the framework for federal pipeline safety regulation of gathering will change, the Pipeline Safety Laws condition PHMSA’s ability to regulate additional gathering lines. Between the longstanding statutory limitations on how PHMSA may define a “regulated gathering line” and the gathering study factors from the 2011 Act, it is clear that Congress expects PHMSA to proceed cautiously in considering further regulation of rural gathering. Ultimately, the Pipeline Safety Laws require PHMSA to continue to take a risk-based approach to the regulation of gathering and to carefully weigh the present risks of these facilities against the economic impacts of subjecting currently unregulated facilities to new requirements. This article originally appeared in the September/October 2012 issue of Trends, the newsletter for the American Bar Association's Section of Environment, Energy, and Resources. To access the article on their website, click here.